When Valentine’s Day falls on a weeknight you need a menu that’s simple to throw together with some make-ahead elements – warm & gooey 3-ingredient Brie tarts to have with some bubbles for an appetizer. 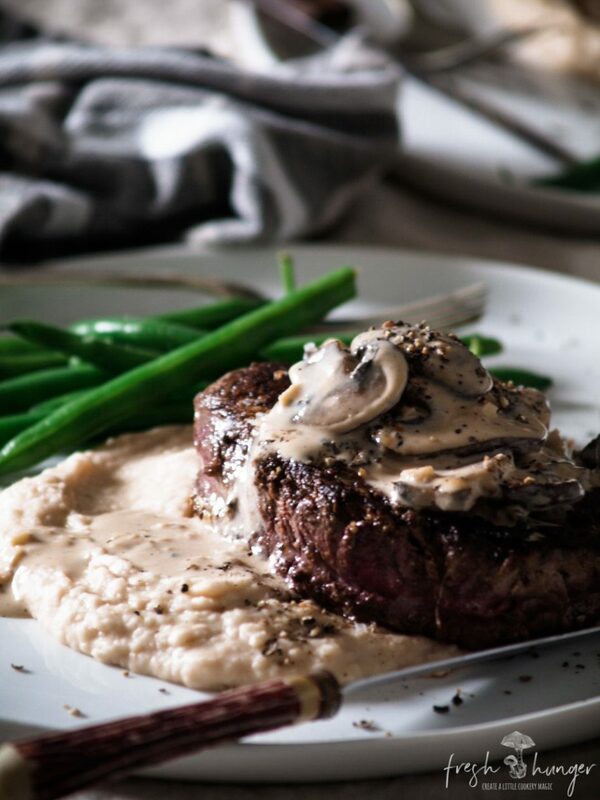 Then perfectly cooked steak served on a parmesan white bean puree (so easy). 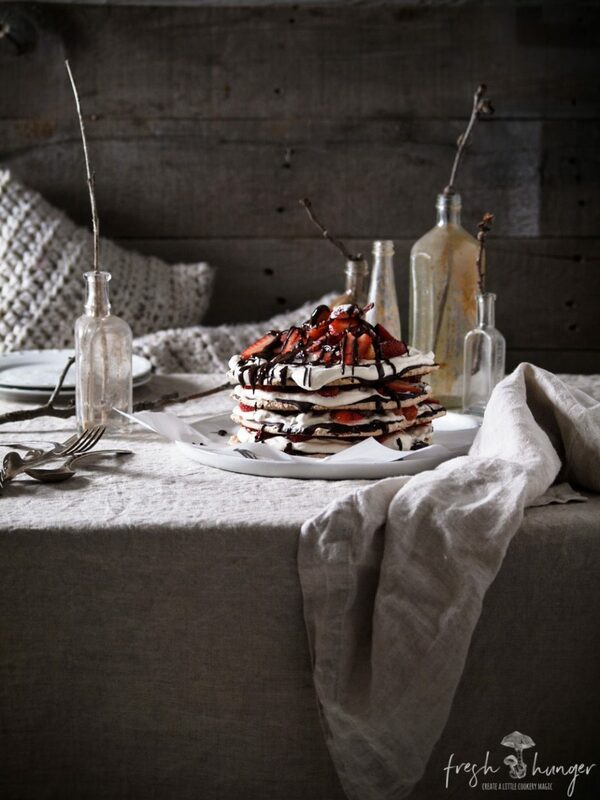 And last, but by no means least – Chocolate Strawberry Hazelnut Torte – so easy because you made it the night before. 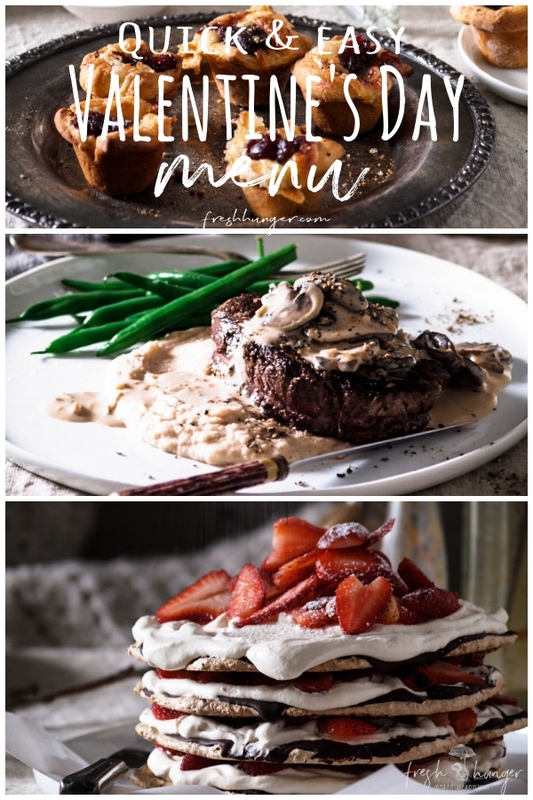 All you need to do is pick up a few ingredients (all these ingredients came from Aldi) to make this fabulous Quick & Easy Valentine’s Day Menu. Now, just to clarify – you’re not going to pull this menu together in 30 minutes. 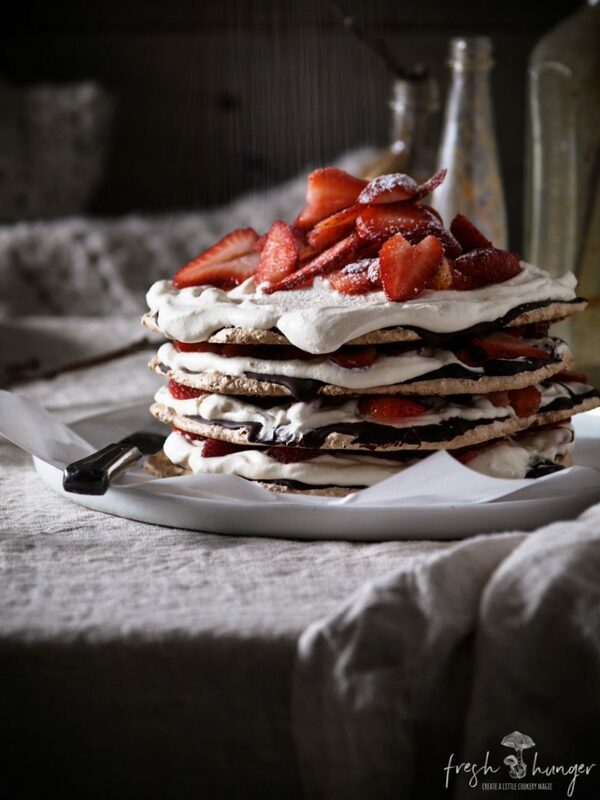 The Chocolate Strawberry Hazelnut Torte for dessert needs to be made the night before & will probably take you about 2 hours – start to finish because you have to let the meringue discs cool down. But then dessert is done, all you have to do is cut it into wedges to serve. 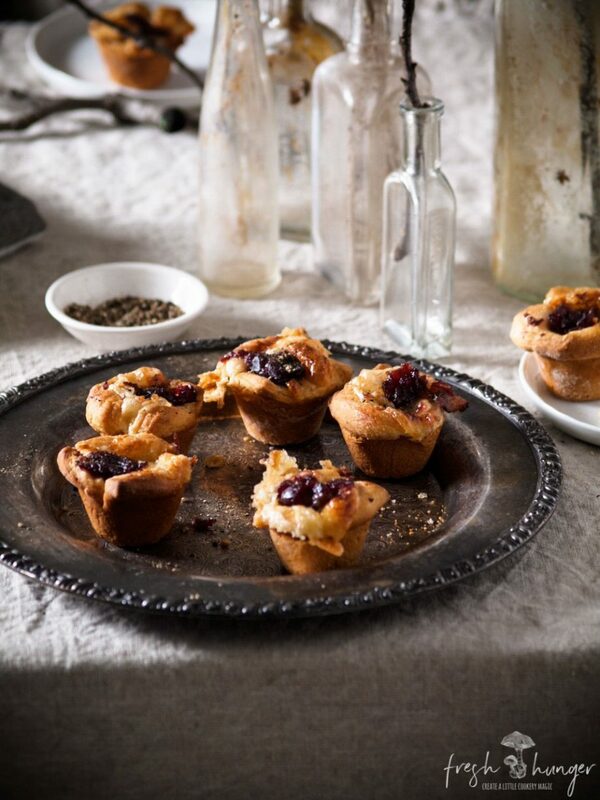 These gooey little tartlets start the meal – 3 ingredients – pastry, Brie & cranberry sauce – or use onion jam, sweet pepper jelly or even cherry or fig jam would be good. I’m shopping at Aldi all month or I would have used puff pastry. But, for some reason only known to the buyers at Aldi, they don’t sell puff pastry. These take 20 minutes to throw together & then 20 minutes baking. 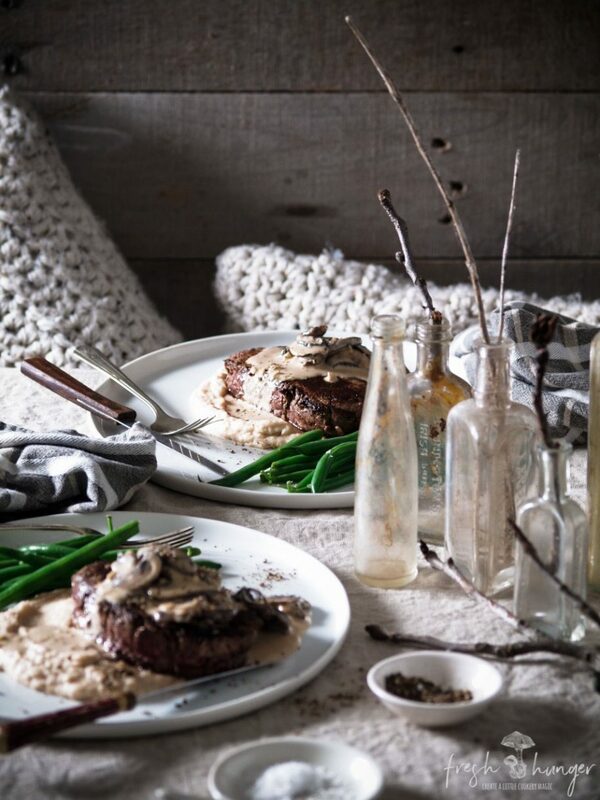 Giving you time to prep the main part of the menu – Steak & Mushroom Sauce with White Bean Puree – that’s almost everything in the recipe in the title. 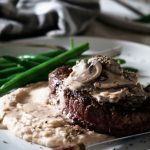 Steak is ALWAYS going to be a winner in our home with my hubby loving a perfectly cooked – medium rare steak. I spent a few extra dollars & went with a fillet steak – the tenderloin. Two of them, each weighing around 7 ounces, were about $13 at Aldi. And they were like butter to cut. 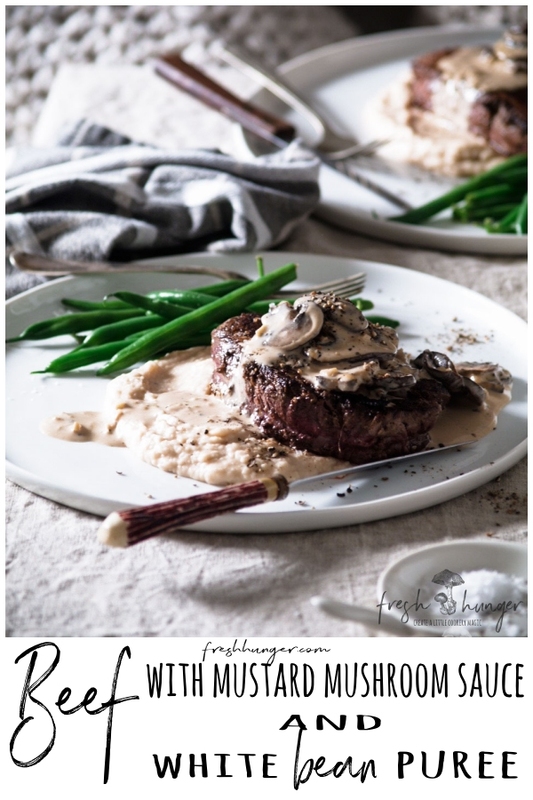 Served with a creamy mushroom & mustard sauce on a bed of white bean puree. White bean puree – soooo much easier than mashed potatoes: open a can of white beans, add a little broth, butter & parmesan cheese after it’s heated & blitz it until smooth. It’s comfort food & a fabulous side to the steak. 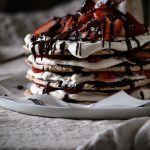 Strawberries, chocolate, cream – so cliched for Valentine’s Day but with good reason – because together they’re perfectly suited – a bit like my hubby & me. 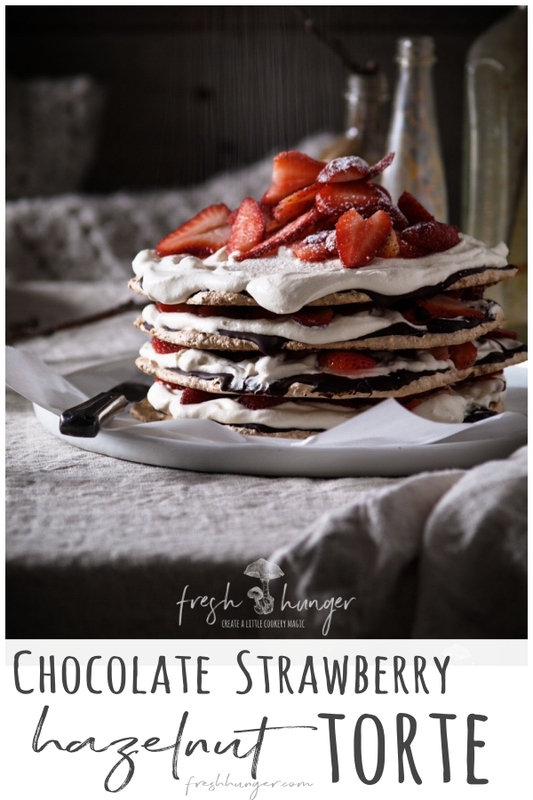 And really you could just have a bowl of strawberries, melted chocolate & whipped cream & dessert is done, but take it a step further & layer all that goodness between hazelnut meringue & OMG!!!! It’s make-ahead which always, always, always wins points in my world. Plus it’s a little nostalgic: mum used to make this dessert (but a large size) for many of my parent’s soirees. Grease 12 holes of a mini muffin pan. Preheat oven to 350F. Unroll dough on a lightly flour surface. Cut into 12 rectangles, pressing together the seams of the dough. Press into muffin pan. Place a piece of Brie in each pastry case. 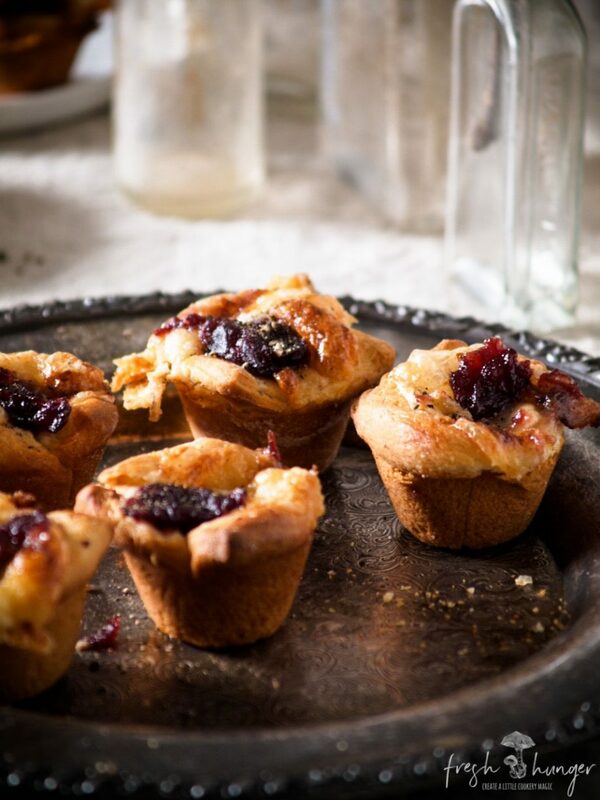 Top with a spoonful of cranberry sauce. 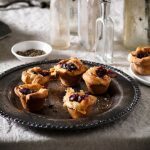 Place a baking sheet under the muffin pan in case of overspill. Bake for 20 minutes or until golden & cheese is melted. Sprinkle with black pepper, if desired. Combine beans & broth in a small saucepan. Bring to a boil, simmer, uncovered until beans are hot. Mash beans using a hand blender until smooth. Stir in parmesan, butter, salt & pepper. Stir until well combined & cheese & butter are melted; keep warm. Sprinkle steaks with salt & pepper & a drizzle of olive oil. Cook in a medium cast iron or non-stick frying pan for 5 minutes. Turn & cook a further 3 minutes for medium rare (135 – 140F). Remove to plate; cover & keep warm. Melt butter in the same pan over medium-high heat. Add mushrooms, garlic & a pinch of salt & pepper. Cook for 5 minutes, stirring once or twice, until browned & softened. Add mustard & wine; cook until liquid has reduced by half. Add 1/2 cup of cream. Bring to a boil. Cook for 2 minutes or until thickened slightly, adding a little extra cream if you prefer the sauce a little runnier. Taste & season with salt & pepper if needed. To serve, place a spoonful of white bean mixture onto a plate or shallow bowl. Add steak & spoon over the mushroom sauce. Serve with beans, if desired. Serves 2. Preheat oven to 300°F (150°C). Trace four, 6 1/2-inch circles on 2 pieces of parchment paper. Turn paper over and place onto 2 baking sheets. Beat egg whites in a large, clean bowl with a balloon whisk attachment using an electric mixer until soft peaks form. Add granulated sugar, a couple of tablespoon at a time, until all the sugar is added. Beat 3 minutes or until mixture is shiny and stiff. Add cornstarch, vinegar & salt & beat for 1 minute or until well combined. evenly between each circle & spread almost until the edge of the circles; smooth tops. Bake for about 30 minutes or until lightly browned & set. 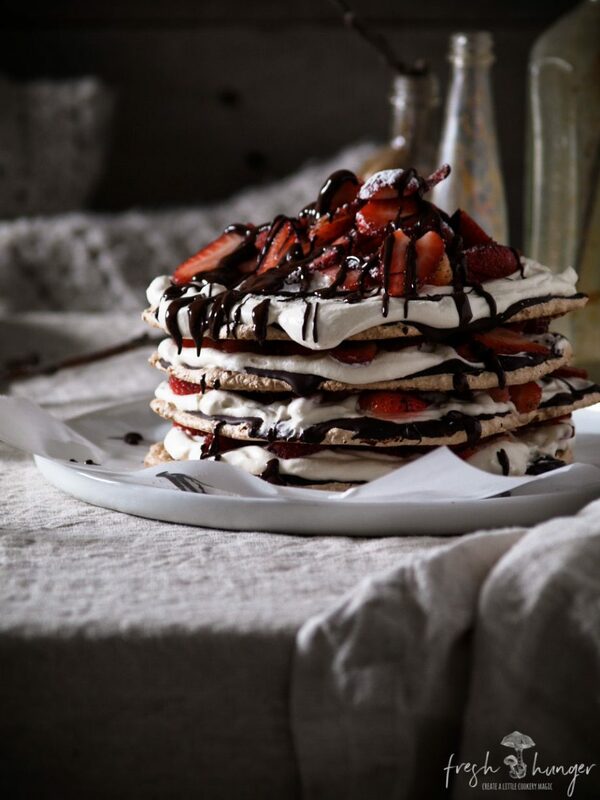 Cool on baking sheets for 5 minutes before carefully removing to a wire rack to cool completely – I run an offset spatula under each meringue disc to ensure they remove easily. Cool completely before assembling. Meanwhile, beat cream & brown sugar in a large bowl until whipped and soft peaks form. *Take whole hazelnuts (preferably ones that have been roasted & had the skins rubbed off them) & place in a food processor bowl; process until fine meal – like the consistency of wet sand. ** Place in a microwave-safe bowl & melt, uncovered, on 30 second increments until chocolate is almost melted then stir until completely melted. Let cool for a few minutes so chocolate doesn’t melt the whipped cream.